Simkar CH LED™ 4-Light LED striplight in baked white enamel finish, features die-formed heavy gauge steel housing. 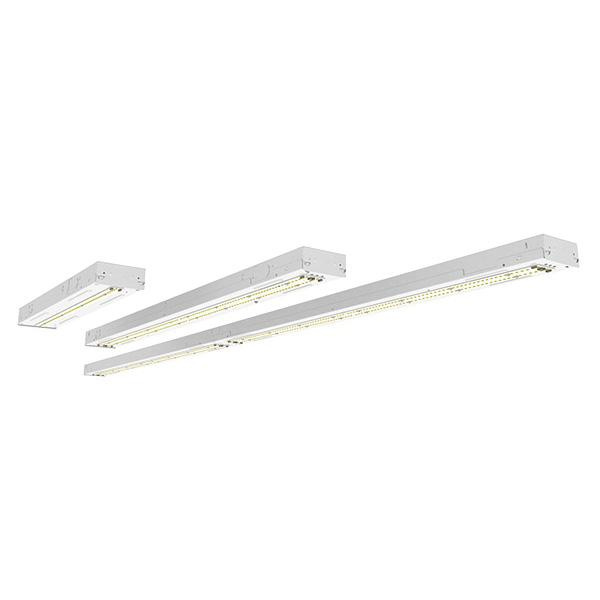 This striplight in linear shape, supports four 43-Watt LED lamps that have voltage rating of 120 - 277-Volts. Lamp has color rendering index of 80 and color temperature rating of 4100K to ensure optimal light level. Lamp offers 5042-Lumens of bright light output. This surface/pendant/stem/chain mountable striplight measures 48-Inch x 4-1/4-Inch x 2-1/4-Inch. It has 0 - 10-Volt dimming control. It has 72000 hours of average life. This striplight is ideal for manufacturing, warehouse and residential applications. Striplight is cULus listed, DLC certified and RoHS compliant.